A staff psychiatrist at Kings County Hospital who pulled in an astounding $515,700 in overtime reported working an average of more than 110 hours a week for a full year -- including one super-human stretch of 96 hours straight. 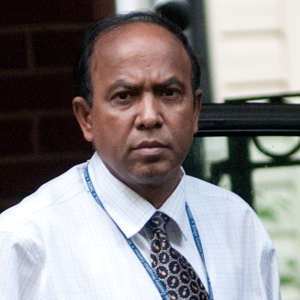 Records obtained by The New York Post under the Freedom of Information Law show that Dr. Quazi Rahman clocked 3,820 hours of overtime in 2009, or 73 hours a week, on top of his regular 40-hour schedule. With a base salary of $173,503, the child-behavior specialist hit the jackpot -- his total taxpayer-funded compensation came to an astounding $689,203. But to reach that mark, Rahman, 55, tested the limits of human endurance. Starting on March 2, 2009, he reported working 55 days in a row without a day off. In the week of April 5 to 11, he exceeded even that astonishing feat by logging 141 hours, including four nonstop days of 24 hours each. Since there are 168 hours in a week, that left only 27 hours when Rahman was off the payroll clock that particular week. Without a break, he then ground out 116 hours the following week, plus 130 hours more the week after. It wasn’t until April 26 that Rahman finally took a full day off. As I read this story, I was naively expecting it to end by saying that the shrink is being held at Rikers Island, while awaiting trial for fraud. Following inquiries by The Post, the city Health and Hospitals Corp. checked Rahman’s time sheets and uncovered discrepancies covering about 80 hours. He was ordered to return $10,800, the value of the disputed time, and pay an additional $10,800 penalty. Phony bills for $689K and he only has to return a measly $22k? I get more cynical every day. How could the regulators not go around asking fellow hospital workers or wherever his office was, etc. if they'd observed the dr. at the facility 140 hr.s straight at times, or working 20 out of 24 hr.s per day for weeks or months on end ? What about his patient files ? They must have reflected otherwise. How many patients was he continually treating in the middle of the night ? Why didn't they follow up with the patients he had claimed to be treating so often, and made sure that he actuslly was seeing them, and if they even existed ? This is an advertisement for doctors to steal, and explains how much they can get away with. There are majority of the counseling institutes are corrupt. They need clients (kids/parents) to bill for tax grants or govt. dollors and if they manipulate symptoms with higher degree then guaranteed to keep kids/parents under counseling for more than six months. Gold mine! We have first hand knowledge of a parent who lied and corrupted counseling of healthy children to gain advantage. When other parent approached and asked why would counselors do such thing without talking to other parent, counselors said, this kind of mistake never happened to them, parent came and told so we took that as truth and counselor said parent brought temporary restraining order (without hearing) so they thought it is true if a judge gave a TRO (without hearing). All they hear from a parent is "Who my god, my kids are damaged, Judge gave me sole custody and TRO". But counselors do not know all this. Then they go corrupt entire innocence of children/parents for money. They reversed on paper what they did. But one of the evaluators said these institutes are incompetent and cause harm to children by doing wrong counseling. This will have harmful effects on kids. In California bay area, we have heavily corrupting organizations such as Kidango, Bill Wilson, First 5, and West Valley Community services. Counselor and referral people confessed that this is what they do in general. They refused to admit their mistakes. When confronted actively by showing the non-sense, then they confessed " I am just an intern. When a parent came here we thought they are telling truths. I am sorry I do not understand all of this". This how they violate children rights and parental rights for billing tax/govt money. In another case, someone with severe emotional issues and criminal records files ex-parte and took kids to counseling institute to set up other parent. These counselors swallowed by that parent and issued a letter on how beautiful is that parent care and kids are afraid of other parent. That parent took that letter and submited to court for another ex-parte actions. We found out the parent who was playing this game was a career criminal in playing divorce games with criminal records and later courts removed kids from that parent for 3-4 years while the parent was under repeated drug rehab and severe emotional issues. Here are two different parents destroyed two different families and children for divorce advantage. All this happening because of family courts due process failure. Massive fraud and corrupting children/parents by fabricating and manufacturing symptoms so they could justify tax/govt dollars and their wrong actions. This industry thrived for the past few decades. Now those children of divorce who are little kids, teens, 20s, 30s, will grow up hating parents and claiming that parents were all fighting in post-separation. So they will move away from parents and mostly withdrawn from them. These kids never get to see the truth of brutal and horrific nature of family courts. CPS, and counseling institutes. This is so unfortunate they would grow as uninformed and rebellious. Most likely may not be part of crowd who goes against family courts.